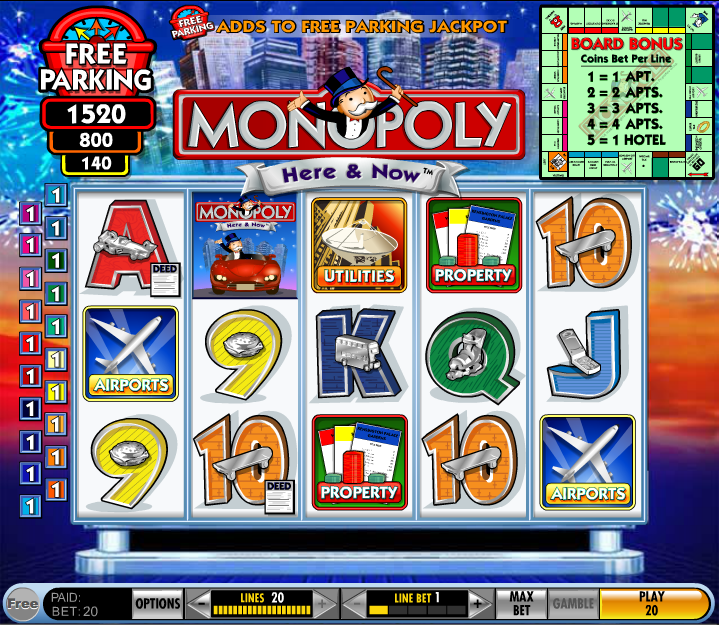 Slots fans familiar with games developed by IGT will be aware that Monopoly Here & Now is not the first Monopoly-related online slot; in the past we’ve previously reviewed Monopoly Dream Life and Monopoly Plus, both of which are top notch slots so Here & Now has plenty to live up to. It certainly looks good, containing loads of bonus features which should satisfy pretty much anyone and it’s based on the updated board game of the same name which introduces more realistic prices and, for example, airports instead of railway stations. Monopoly Here & Now loads up with a great swing soundtrack; it features five reels and twenty paylines and loads of updates symbols from the new board game. The 9, 10, J, Q, K and A are adorned with playing pieces such as a skateboard, a mobile phone and in-line skate. More valuable symbols are the airport, the utilities, property and the game’s logo and there are two special symbols – the Monopoly man wild and the dice bonus symbol. Let’s also not forget the free parking symbols and the property deeds which we’ll explain below. Deed Symbols – these are attached to some of the standard symbols and landing three on an active payline will prompt Monopoly man to upgrade one of the properties in the bonus game. Whether you’re playing with 1 – 5 coins will determine whether the property is upgraded with 1 – 4 apartments or a hotel. Those two above bonuses help you out in the Board Bonus game which can be won by landing three of the dice bonus symbols on an active payline. When that happens you’ll first be prompted to pick one of the dice which will determine the number of rolls round the monopoly board you’ll receive. Now the board appears and you get to pick your playing piece and to roll the dice that number of times; everywhere you land will reward you with something, whether it’s a property award (hopefully upgraded by the deeds) or another increase in the Free Parking jackpot. One of those jackpots is won by first landing on the Free Parking space and then playing a car race mini-game – the car which reaches the end first will win that particular jackpot which will then be reset to £500 in the base game. There’s so much going on here that it’s difficult to point to one thing which might improve your chances; the Persistent Equity feature means that board upgrades and Free Parking increases will remain in place if you leave the game – as long as you play at the same stakes when you return. What a great slot! There’s loads going on and you want to keep playing to trigger the Board Bonus because you keep contributing all the extras to it. Not to be missed and a worthy addition to IGT’s Monopoly family.